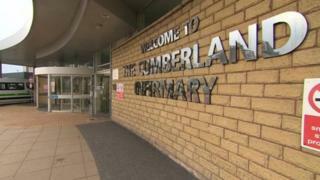 The number of beds at a Cumbrian hospital are to be cut in a bid to encourage recovery at home. North Cumbria University Hospitals NHS Trust said it was closing 16 of its 369 inpatient beds at the Cumberland Infirmary from 1 October. The Trust said more operations would be offered at West Cumberland Hospital, in Whitehaven for overnight recoveries because of its more modern facilities. It added that unnecessary hospital stays hindered recovery. There will also be a new therapy ward at the Cumberland Infirmary, which will offer rehabilitation to patients before they are discharged from hospital, the trust said. In recent years, the health service has moved towards providing care for people in their own homes, rather than in hospitals by setting up Integrated Care Communities (ICCs), the Local Democracy Reporting Service said. The Trust serves a population of more than 340,000 people across the county and employs about 4,500 staff. Stephen Eames, chief executive of the Cumbria trust and lead for the North Cumbria Health and Care System, said: "We know that once a patient has had a procedure or has been treated for an acute illness, hospital is no longer the best place for them. "With the establishment of the eight ICCs, we feel now is the time to reduce the number of beds we have at the Cumberland Infirmary by a small number and to use the area to improve patient experience when coming in for a surgical procedure by relocating the surgical pre-admission unit."